When vacuuming professionally, there are a number of things that I need to do and I do not want to worry about having to drag around a vacuum or push it wherever I am going, this is why I would recommend the best commercial backpack vacuum to professional cleaners since it is always on your back and will go wherever you are as long as the cable allows. This guide is the outcome of in-depth research to find the perfect fit for different preferences. I have considered what other consumers think, what the manufacturers say as well as the professionals. If you are engaged in commercial cleaning, some of the important features you will be interested in would be the suction power as well as the quality of air as you vacuum. This machine seems to be designed to help you get the job done effectively and it is not heavy which makes it comfortable to carry on your back the whole time you are vacuuming and you can still manage to hear someone talking to you as you vacuum since it is not too loud. ​It is only for dry vacuuming so you need to purchase a wet one as well if you need to vacuum wet debris. This was carefully designed by a chiropractor to ensure that the weight of the Hoover does not have a health impact on your back. The weight is well distributed to the hips. I also like some other features like the see through glass to know the level of debris in the container and the fact that hot air is not blown onto your back which makes you more comfortable. Generally, this stands out for its comforts as well as performance. 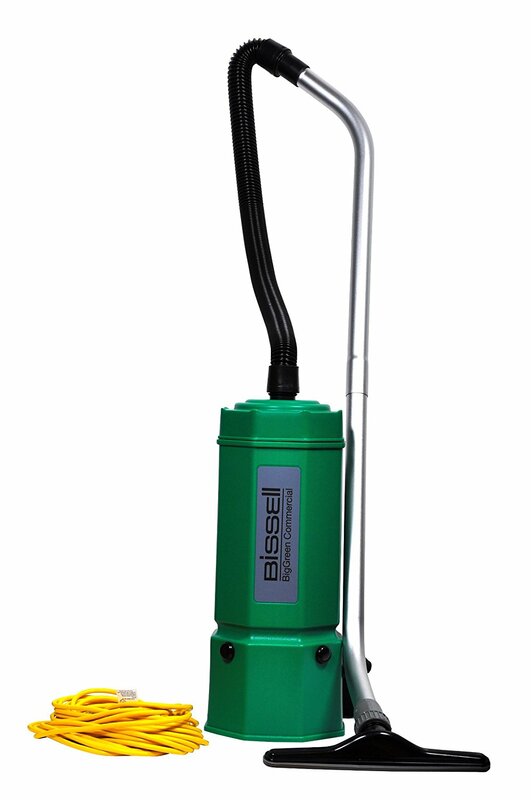 Sometimes I worry that while using a commercial backpack vacuum, it may overflow and end up causing a mess and blowing dust into my face, this is why I like this Bissell- no not because it spills dust, it actually prevents that from happening by letting you know when it is full so you can empty it. It also has good filtration to ensure dirt does not escape and the straps are comfortable without too much strain on the back and shoulders. Its lightweight too ensures it does not become a burden on you. ​The position of the on/off switch makes it easy for it to be easily turned off or on as you pass through tight corridors or other spaces. 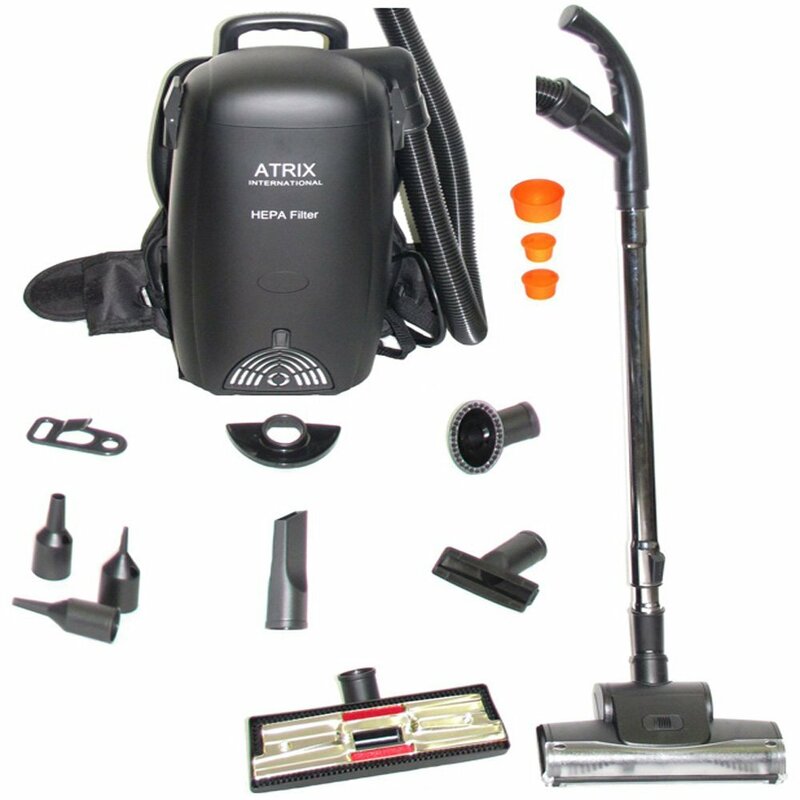 For an effective commercial backpack vacuum that is still affordable, this is one you may wish to try. 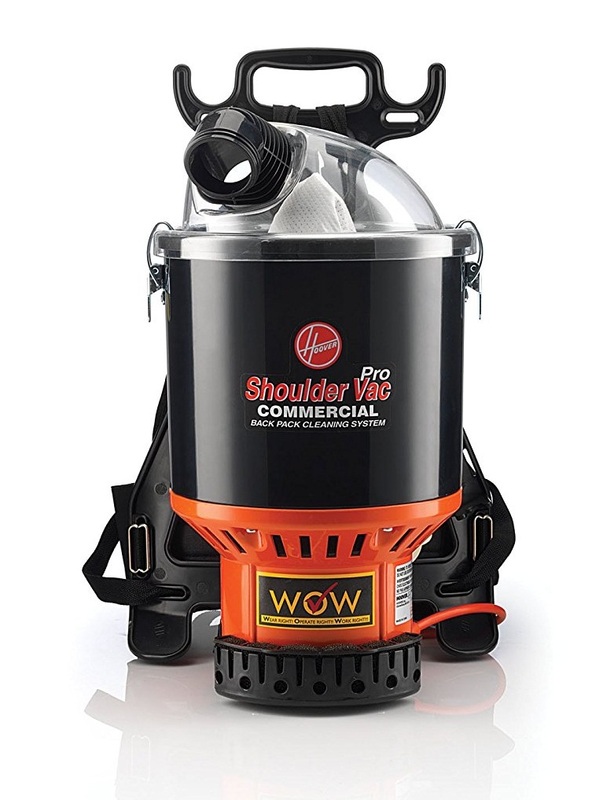 It is made for any kind of cleanup, be it hospitals, hotels, drapes, movie theaters and it is also preferred for sucking up bedbugs from the spaces they hide since it comes with narrow tips that can concentrate suction in crevices, cracks, and corners where an ordinary crevice tool may fail. It is also designed to save you from having to walk back and forth when you need to switch tools. ​And when you find dirt that cannot be sucked, you can blow it. If you are the kind of person that does not like noisy vacuums, you are likely to be drawn to this one because the manufacturer promotes it as a quiet clean and according to a few commercial backpack vacuum reviews, its noise level is just 69 decibels which would be quiet for a vacuum. It provides a decent cleanup and manages fine particles of dust well with the HEPA filter that filters waste up to 0.3 microns. For hard to reach spaces as well as wide spaces, you can strap this backpack vacuum on and get them cleaned quick and easy. It has a 50-foot extension cord which allows you to cover more ground without having to switch sockets. It comes with an assortment of tools which enables you clean different surfaces like hard floors, carpets, drapes and furniture. You can choose to use either the washable filter bags or disposable ones. ​It is not light for people with smaller frames, especially women. A lot of the decision making in this comes down to the features of the backpack vacuum. Here are some of the important features to pay attention to. This item is going to be on you back for a fairly long period so it is important that you have the right weight. A normal adult should be able to handle anything below 10 pounds. It is also important that the backpack is designed to distribute the weight evenly to avoid straining the back or shoulders. The filters will ensure that the quality of air is clean. Remember the unit is on your back so what comes out is much closer to your nose than it would be with a vacuum that is on the floor so ensure that it filters the air to reduce the risk of inhaling allergens. 4 stage filtration or HEPA filters come as the best-recommended filter systems. The length of the cord determines how far you will be able to go from the source of power before you need to switch to another socket. It is best for the cord to be as long as possible. 50 feet seems to be the more preferred length, even if there are shorter cords. Think of the areas you will be vacuuming and that can guide you in choosing an appropriate length. Exposure to loud noise for a long time is not good for your hearing. With a backpack, the noise is going to follow you everywhere and it is much closer to your ears than it would be with an ordinary vacuum. It is important for this reason to have a backpack vacuum with reduced noise. 69 decibels and below would be appropriate. Tools will facilitate your ability to clean certain areas, it is important for that reason to have the right tools for the kind of jobs you will be doing. Wands and hose are some of the most important tools but also the attachments like the floor tool, the brush and crevice tools have important parts to play. It is best if the tools are part of the package and not that you have to buy them separately as that becomes an added expense you can avoid. You need to find out what added features provide comfort. Cushioning of areas that tend to make contact with the body is important and you also do not want the unit to keep on moving around on your back so an extra strap to keep it firm would be necessary and the air that is blown out of the vacuum should not be blown in the direction of your body since that will make you hot and uncomfortable. 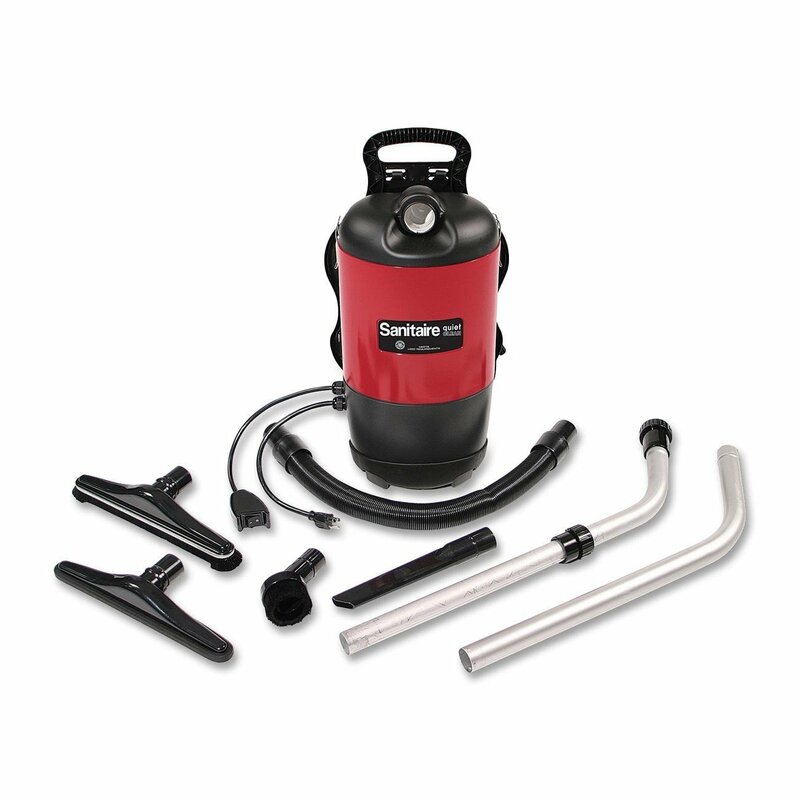 Why Use a Commercial Backpack Vacuum? First of all, they save you from having to pull or push around a vacuum which may tip over and takes up a lot of time. It is much better for your wrist joints since there is less weight for you to have to maneuver around in comparison to upright vacuums. 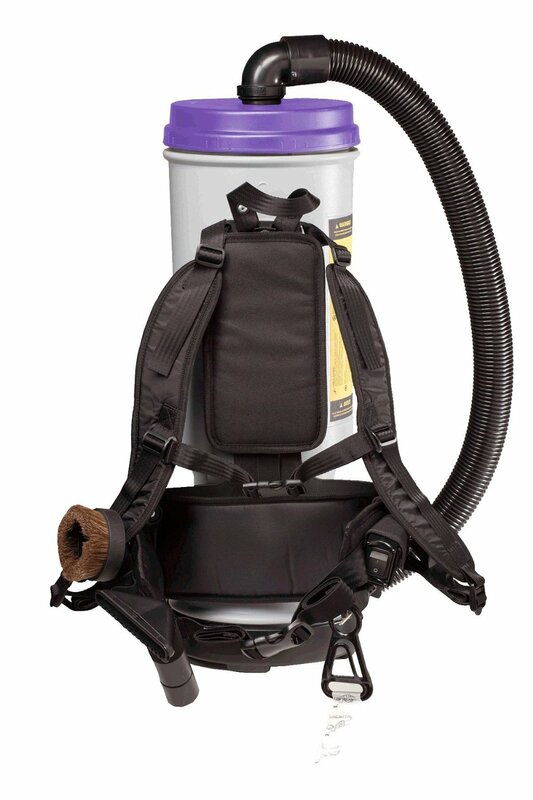 Most of the good backpack vacuums have good filtration which ensures better air quality as you vacuum. They are easier to use in tight spaces. 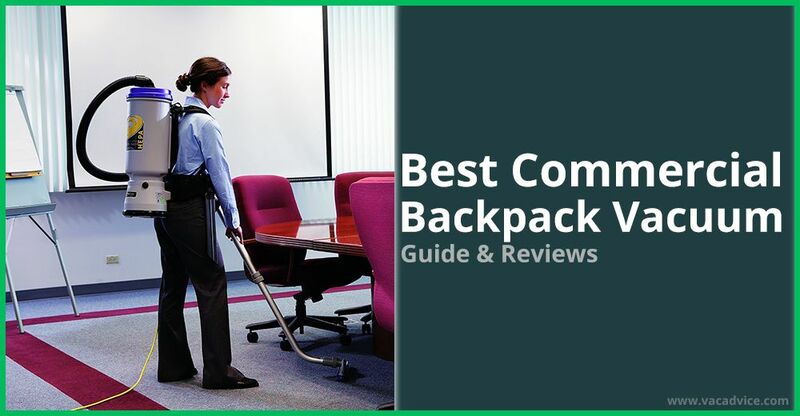 ​I must admit that with the best commercial backpack vacuum list, it is quite a tight competition since most of those in this list share similar features. If money is an issue when making a choice, then you can look at the Atrix vacuum which works quiet well yet is the cheapest in the list. The Super Coachvac is feature rich and has a big capacity and longer wand though it is probably the most expensive. Personally I would choose the Super Coach because of its ability to reduce the strain on my back. Whichever you choose, you can be sure it will do a good job.